Mr. Morgan led the Edgartown Fourth of July parade as grand marshal for 43 years. Fred B. Morgan Jr., the decorated World War II veteran who parachuted into Normandy on D-Day and long-serving Edgartown selectman, died on April 7 at the Martha’s Vineyard Hospital. He was 97 and was widely regarded as Martha’s Vineyard’s senior statesman. Services are planned for Monday at 11 a.m. at the Old Whaling Church. Interment will follow in the New Westide Cemetery with full military honors by the Veterans of Martha’s Vineyard. A son of Edgartown, Ted Morgan, as he was known, fought in six campaigns in World War II and later became a prominent town father, serving as a selectman for nearly 31 years until his retirement in 2002. As a selectman, Mr. Morgan was known for his steady hand on the tiller and also for being unafraid to take a stand when it was called for. He presided over numerous threshold moments for the town, including the strategic purchase of South Beach and the Katama Airfield in the 1980s. And he was a selectman in the 1990s when the town successfully defended a challenge to three-acre zoning during a controversial development plan for Herring Creek Farm. The case went all the way to the state Supreme Judicial Court. Fred B. Morgan Jr. was born in Edgartown on Sept. 12, 1921, a few blocks from Main street, the son of Capt. Fred Baxter Morgan and Doris Taylor Morgan. His siblings were Robert and Jean. They lived in a modest house on School street. The Morgans were a seafaring family, and the senior Mr. Morgan, who was known as Captain Ted, skippered a number of vessels, including the schooner Eliza A. Benner. Doris Morgan died in 1937 at the age of 38. Young Ted was 18. He joined the Army at age 19, straight out of high school. Ted and Floss married in 1945. Mr. Morgan went on to a distinguished military career that included more than one tour of duty in active combat. He served as a medic and paratrooper in the 82nd Airborne Division. He jumped from military planes 25 times onto European soil during World War II, and earned a Bronze Star and the Purple Heart for courageous service. He endured a harrowing 33 days of combat in France following a jump into enemy territory during the initial phase of the Normandy invasion in 1944. 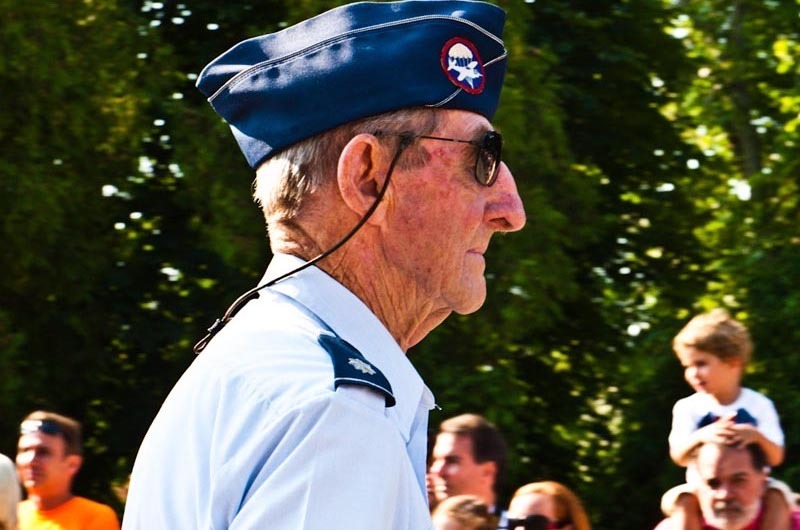 In 1949, he was called back to duty, this time serving in the U.S. Air Force, where he spent the next two decades as an administrator of military hospitals across the country. He achieved the rank of lieutenant colonel upon retirement. Mr. Morgan did not speak publicly about his war experiences for half a century. In 1994 on the 50th anniversary of D-Day, he was moved to break his silence. Rather than return to Normandy for the many high-profile media events, he decided instead to stay on the Vineyard and share his stories with Vineyard schoolchildren. He told his story before a classroom at the West Tisbury School. The students were spellbound. Ted, Floss and their six children returned to the Island in the late 1960s when he took a job as administrator at the Martha’s Vineyard Hospital. He stayed in the post only for a few years, but he rejoined the hospital leadership in the late 1990s as a member of the board of trustees. He was elected to his first term as selectman in 1972, unseating incumbent Jean Hathaway in a race that saw record voter turnout — 899 voters out of 1,173. In politics he was well known for his conservative views. A staunch Republican, he frequently railed against the Beacon Hill Democrats who irked him. His brother Robert was a politician too, but Bob was a Democrat who served as the Vineyard legislative liaison, among other things. In 1999 Ted and Bob Morgan relived childhood memories when the keelson of the Eliza Benner was recovered from waters off Chappaquiddick. Their father (who died in 1949 at the Marine Hospital in Vineyard Haven) had skippered the 60-foot schooner. Sometime in the 1920s the Eliza Benner went aground and sank in a storm. Sitting on the keelson, Bob and Ted posed for a picture. Bob Morgan died in 2008. Ted stepped down as a selectman 2002 before the end of his 10th term. There was no fanfare; it was not Mr. Morgan’s style. He was 81. In a role that endeared him to Islanders of all ages, he led the Edgartown Fourth of July parade as its grand marshal for 43 years, stepping down in 2012. Advancing age had made it difficult for him walk the entire route but Mr. Morgan remained a parade fixture, traveling in a golf cart in what has been called one of the best small-town parades in America. One of his favorite pastimes was golf; he was a longtime member of the Edgartown Golf Club and served as club president for many years. The selectmen’s room in the Edgartown town hall is named for him. He is survived by his wife Florence Lambert Morgan, whom he always credited for his successes, and a large extended family that includes children, grandchildren and great-grandchildren living on and off the Island. Donations can be made to the Martha’s Vineyard Boys and Girls Club, P.O. Box 654, Edgartown, MA 02539. Arrangements are under the care of the Chapman, Cole and Gleason Funeral Home in Oak Bluffs. Visit www.ccgfuneralhome.com for online guest book and information. I am concluding my own military career as a lieutenant colonel in the US Army in a few months. Growing up in Edgartown, Ted Morgan was my role model through 22 years in the military. Godspeed LTC Morgan...you will be remembered. Ted served his family,his country and his town in the finest way. Was privileged to have met and talked with Lt Col Morgan on a few recent trips to the Vineyard. His generation saved the world. We must never forget their incredible sacrifices and contributions to mankind. I know I will never forget Fred Morgan and am forever grateful for brave men such as him. RIP sir. What a role model for all. He will be truly missed by all he touched. Ted was extraordinary in every facet of his life and his service to country and town. He's a name the town will never forget. Rest in Peace, Ted. Over the course of my Island newspaper career I had many opportunities to speak to Fred “Ted” Morgan. He was one of those rare individuals, an elected official who always gave a reporter a straight answer. More than that, his commanding presence inspired one to want to stand a bit straighter, do a bit better. It has been many years since I attended Boston English High School, then located on Avenue Louis Pasteur in an aging brick building built with a touch of classical elegance, a marble foyer with inspirational quotes etched into the surrounding walls. But one message remained stuck in my mind: “Service to mankind is honor and achievement.” I thought of that quote when I learned that Ted died Sunday. He served his beloved Edgartown, the Island and the nation with honor and distinction. He will be missed. I had the honor of working with Ted at the All Island Selectman's Committee many years ago. He was incredibly thoughtful, always respectful, even in the face of disagreement, and generous of heart. His example is one that is sorely needed in these difficult times. His passing is a big loss for the Vineyard. I had the honor of knowing the Lt. Colonel for many years and marched in many parades with him. He will be greatly missed by all who knew him, especially the veterans community. My condolences to his family. Well said, Mark. A true gentleman. Mark - I know Ted had a very positive impact on your life, all the members of EGC and so many others. What an outstanding human being and a pleasure to know Ted over the years. Mark, You and Ted made a GREAT TEAM! Our family always looked forward to seeing you and Ted at the very SPECIAL July 4th Parade. A gentleman, a patriot, a servant to all. His presence will be sorely missed. RIP Ted!! Your obituary did a fine job of describing Ted Morgan. He was an important man, made clear by his achievements and bearing, but he walked the earth humbly, always ready to lend a hand. While stationed in Menemsha Coast Guard, I bought a forty-year-old fishing vessel, which I brought to Edgartown every fall, as my residency there enabled me to get a commercial scallop license. Upon learning that I was having difficulty finding a mooring in Edgartown harbor, his daughter, my wife's best friend, suggested I speak with her father, who was managing Edgartown Marine. Mr. Morgan suggested a berth between two dock extensions near the fuel pumps, where a thirty two foot wooden fishing boat that drew over three feet could ride out almost any kind of weather. He told me my vessel would "dress up" the boatyard and wouldn't let me pay for what had to be the finest berth in the harbor. When I told my dad this, he suggested I not bring the topic of payment up again, and several months later I presented Mr. Morgan with a bottle of cognac my dad had picked up in Panama. The label was significant, and Mr. Morgan knew exactly what it was. He thanked me with that wide smile familiar to so many on the island. A seemingly insignificant encounter, but one that points up the warmth and sense of right and wrong and proportion he was known for. These traits were inherited by Pam, his daughter, who used them during her years of service to Edgartown. Mr. Morgan was a great man in every sense of the word, and his passing marks the end of an era. My deepest sympathy to his family. Ted is right where we need him to be. Bless his family and friends and anyone he had not the chance to meet. Everything is as it should be. Like many others, I will miss you Ted. Sitting on the bench talking to you about all your Military experience. Especially the Vietnam War. I would share with Jack. His experiences were so different, and he was glad you would talk to me about all I did not know. Thank you Ted. God Bless your family. Ted was a wonderful human being. In my service to Martha's Vineyard as State Senator in the 90s, I found Ted to be a source of profound insight into the issues confronting the Island. He will be missed. Helluva Life, Helluva Guy, always made time for anybody, Could throw a golf club almost as far as he could hit a golf ball. I'll miss him. When it came to the fourth of July parade he would often call me and ask me to organize the County Commissioner car. He would have a vehicle set aside and we stepped exactly at 5pm. Ted was a good and fair man, thank you for your service to your country and town. My condolances to Floss and his family. Ted and Fred were lions of the island community for as long as I can remember. I sometimes had the privilege of driving John Alley in the County Commissioner car in the fourth of July Parade. Ted always came over to greet us all and make us feel welcome. He will be greatly missed by all. Godspeed, Ted. My sincere condolences to the Morgan family. A pristine example of a life of service,patriotism,family and community devotion. A true American from the last of the greatest generations. Our kids need to be involved with these amazing people now more than ever given the democratic attack on all that we hold sacred as Americans. Thank you for your service and finest example of a life fully lived Sir. We are fighting hard to save the USA from freedoms being stolen. You fought for them and it's our duty now. My deepest sympathies to Ted's family and loved ones. The greatest generation. Mr Morgan was the real deal. RIP sir. RIP Sir. Thanks for your help making the island special. We will always cherish our great memories of a great man. Ted never compromised his standards to achieve a desired outcome. He set a high bar for his ethical and moral positions that was, and is, an inspiration to all. His unselfish demeanor always put the Town, the Edgartown Golf Club and many other civic ventures above any personal agenda that had the potential to benefit him. We enjoyed our friendship with Ted and will miss him. Regards to Floss, Pam, Scotty and the whole family. Whenever I look at paratrooper wings, I will remember you, Ted.